Here is the cover for Meg Rosoff's forthcoming 2009 novel The Bride's Farewell, due out from Viking in August. Sort of gothic and whimsical, isn't it? Love the title font. From the publisher: In 1850s England, a young woman named Pell runs away from home on horseback the day she is supposed to marry her childhood sweetheart. Pell is from a poor preacher’s family; made poorer by the ever-increasing number of mouths to feed. Pell understands horses better than she understands people, so she sets off for Salisbury Fair, where horse trading takes place, in the hope that she can find work and buy herself some time while she decides what to do next. As she rides further and further from home, Pell’s emotional ties to her parents, to her many siblings, and to the fiancé only become strengthened and eventually alter the course of her travels. 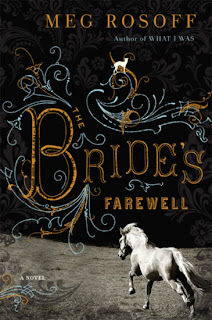 The Bride's Farewell is a beautifully told novel about learning how to live, how to be human, and how to love. Lol. I know. Some covers are just enticing that way.